An airborne laser built for the U.S. Missile Defense Agencyfailed to destroy a target missile when a software glitch threw off itsprecision aiming during its latest field test. The anti-missile system aboard a Boeing747 flying laser laboratory managed to detect and track a liquid-fuel,short-range ballistic missile at the Point Mugu flight test range off theSouthern California coast on Sept. 1. A safety system aboard the aircraft detected the misalignedbeam and immediately shut down the high-energylaser as it attempted to take down the missile, according to DebraChristman, a spokeswoman for the Missile Defense Agency. The agency announcedthe test results on Sept. 10. The time to destroy a target depends on factors such asdistance to target, type of target and atmospheric conditions, Christman explained. The laser test was meant to destroy the target missile fromtwice the distance of the past tests. The Missile Defense Agency does notdisclose actual standoff distances for flight tests. 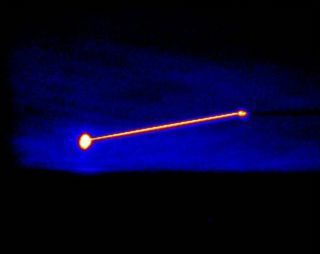 The Airborne Laser was originally designed as an operationalsystem that could shoot down missiles during their boost phase, but has since servedas merely a technology development platform. Two kilowatt-class solid state lasers housed in the noseturret of the Boeing 747 help track the missile target, and also correct foratmospheric disturbances by using an adaptiveoptics system. A main megawatt-class, high energy laser then seeksto destroy the target. A first shoot-down test in February allowed the aircraft todestroy a boosting sounding rocket. It then went two out of three forinterceptions eight days later, when it tookdown a liquid-fuel ballistic missile but failed to eliminate a secondtarget in the form of a solid-fuel sounding rocket.Planning for future tests isunderway despite the recent failure. Tests of the repaired software were slated to begin on Sept.13 and will lead to another shoot-down attempt involving a solid-fuel targetmissile by the end of the month. The agency has also begun planning for a mid-Octoberexperiment would have the laser target a solid-fuel missile at three times therange of the successful February test that destroyed the liquid-fuel ballisticmissile.